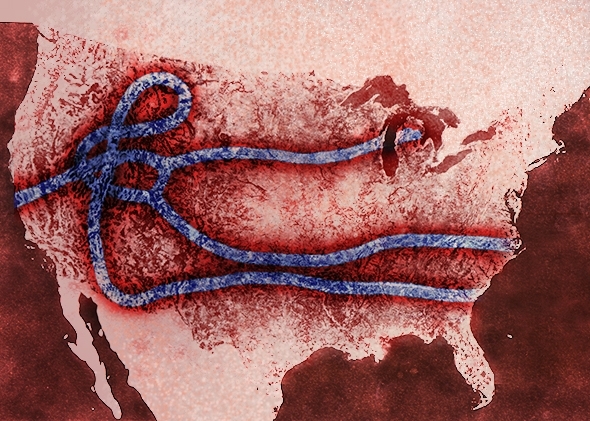 Observations: Ebola infected West Africa – Will it now infect the United States? Ebola infected West Africa – Will it now infect the United States? Four days later the “unlikely” occurred: the first person infected with Ebola arrived in the U.S. from Liberia, where he had assisted an infected woman, become contaminated, but did not tell anyone about it in order to get on a plane and travel to Dallas, Texas. It took three different flights for him to get here and no one along the way apparently knew he had been in Liberia, or was able to determine that he had been infected, since he was asymptomatic until after he got here. After developing a fever, he visited Texas Health Presbyterian Hospital, was treated and sent home, despite having recently been in Liberia. He was staying with relatives in Dallas and as the disease progressed he got sicker and became contagious, and after that he returned to the hospital and was diagnosed with Ebola. Several days later, he passed away. His relatives were exposed to Ebola, and the residence and outside areas were contaminated. Who knows how many others were exposed to the virus? Mr. Obama said we can handle this, should the need arise. But the need arose, and a well-respected hospital didn’t handle the first infected person very well at all. The first airport screenings began Saturday at New York’s John F. Kennedy International Airport in New York. Other airports were to begin screenings this week. Screenings at African airports and another screening at U.S. airports, the president said, would make it unlikely that someone infected with Ebola will get to the U.S. Given the botched handling of the first Ebola patient in our country, can we believe Mr. Obama? “No matter how many of these procedures are put into place, we can’t get the risk to zero,” said the Centers for Disease Control and Prevention’s Martin Cetron, director of the Division of Global Migration and Quarantine. He told a news conference that these new measures wouldn’t necessarily have detected Ebola in the patient who traveled to Dallas. Complicating an already unnerving situation, a second case of Ebola at the Dallas hospital has now been confirmed. A female nurse who had cared for the Ebola patient prior to his death was assessed on Friday, CDC Director Dr. Thomas Frieden said, and on Sunday it was confirmed that the nurse has Ebola. The nurse’s infection is blamed on a breech of protocol. One report said that when removing the protective clothing she was wearing, the nurse inadvertently touched her cheek with her gloved hand, a glove that was contaminated with the virus. And now she has Ebola. And now, the disease has a small, but troubling presence in America. This second error at this hospital has put other hospital personnel at risk, and may have infected one or more of them. Raise your hand if you believe the U.S. healthcare system really is prepared to deal with Ebola patients. Even without these errors in handling Ebola in Dallas, it simply makes no sense either to bring potential or actual Ebola patients here, or allow people from countries where the disease exists to come here. Why take the chance of exposing Americans, particularly healthcare workers, to this vicious disease? President Obama has a giant blind spot when it comes to protecting the country from illegal entry of who knows who through the southern border, and now that blind spot extends to failing to stop people potentially infected with Ebola from coming into the U.S. In situations like this one, we need to be smart, not compassionate. We can help the unfortunate West Africans by sending medical supplies and assistance without needlessly putting ourselves at risk. And we must. Those in charge know what they are doing. I believe they are right on schedule in order to contain law abiding citizens. "Fundamentally change America", how can anyone not know what that means? I keep thinking so much of what O does is designed to create a situation where he can declare martial law.